cornbread wife saver | eating with S.O.L.E. I loved how toasted and dark the already baked crusts of corn bread got, and the whole dish was reborn, and so great for brunch, breakfast, even a cold slice on the run, this is soooo making a return to my kitchen. I was gifted a lovely little jar of salsa verde from a gal who took my recent canning& preserving class and I knew those bright flavors would be prefect with the corn bread revitalization I was dreaming up. 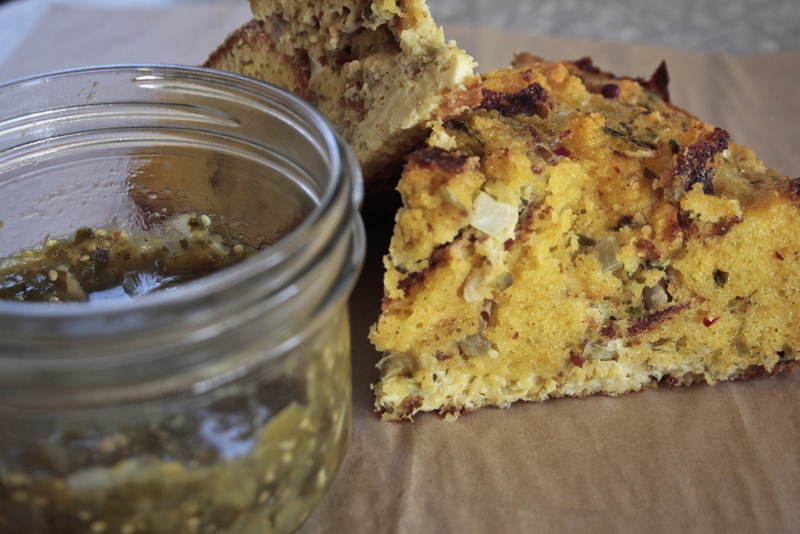 Next time you have stale corn bread… wife saver to the rescue! Start by cubing up bits of stale corn bread and toss them into a buttered roasting dish. Throw in some finely chopped onion, and tomatoes (just a bit), add in some chunks of fresh feta cheese along with a handful of fresh cilantro. In a large mixing bowl beat about 1 cup of milk with 8 or so eggs (depending on how much leftover bread you have, and how big your pan is, you want to fully cover all the bits and bobs in the dish with egg mixture).Season mixture with: S+P, garlic granules, hot chili flakes, a pinch of parsley, and 2 tbsp of salsa verde. Pour egg mixture over corn bread until full and submerged. Sprinkle the top with some sharp cheese and set in fridge overnight. Not sure if the wife saving part of this recipe is the fact that the wife saved the stale bread or the wife waved time by making breakfast the night before, but either way once the dish is left over night to soak up the egg and seasoning, it’s ready for a roasting in the oven. Cook at about 325 for 35-45 minutes or until nicely set, firm and golden brown. Ta-da a not so white bread version of this old classic. After making this I though some blacked corn would be a great addition to this dish too, and hey if your into SPAM then hit it, ugh. I joke.